Checkmate! This beautiful Romans vs. Egyptians Chess Set includes 33 handcrafted pieces from the feuding kingdoms on a glass board. Approx. Size for this set is 17" Length X 17" Width x 3.75" Tall. Checkmate! 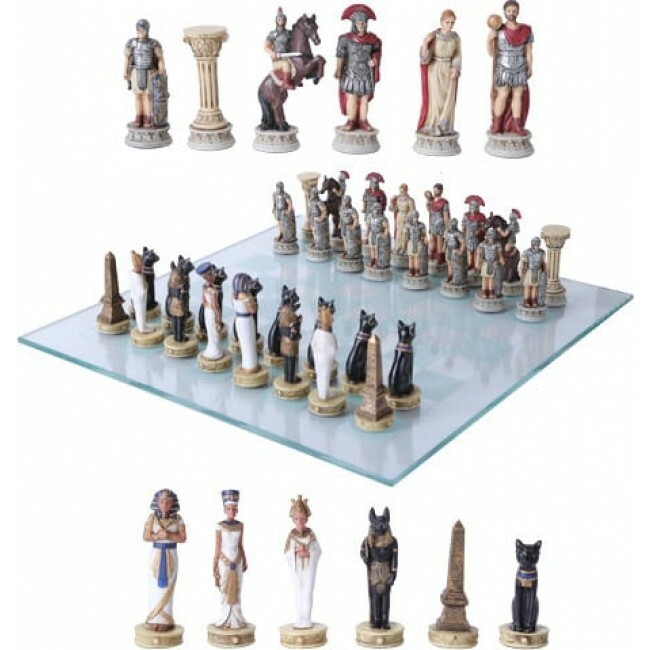 This beautiful Romans vs. Egyptians Chess Set includes 33 handcrafted pieces from the feuding kingdoms on a glass board. Approx. Size for this set is 17" Length X 17" Width x 3.75" Tall. The product is hand painted with high quality Cold Cast Resin. A perfect set for Chess lovers and Ancient History buffs alike. Not Recommended for Children Under 12.